Piazza di Spagna is one of the most picturesque places in Rome. 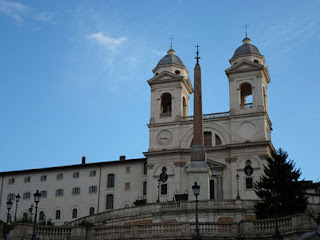 At the top of the Spanish Steps is the late Renaissance church of Santissima Trinità dei Monti and at the base of these steps in the middle of Piazza di Spagna is the Colonna dell'Immacolata. This column was dedicated in 1857 to honor the recently declared dogma of the Immaculate Conception. The four Old Testament prophets encircling the base of this column (Moses, Isaiah, David, & Ezekiel) each gave prophecies that alluded to a virgin birth. From the church of Santissima Trinità dei Monti cut across on Via delle Carrozze to visit the large church of San Carlo al Corso. After visiting this church walk south along the Via del Corso until you reach Via della Mercede. Turn left to visit San Silvestro in Capite. From here head south to Santa Maria in Via where you can quench your thirst with a cold drink of water from a miraculous well. Finally continue to the east to visit Sant’Andrea delle Fratte and Santa Maria della Concezione. The following churches are listed according to the order of the suggested route. The total distance is about 1.25 miles. To walk will probably take about 3.5 hours if one visits each of the churches. The churches are generally open from 7AM-1PM and from 4PM-7PM. *This church is at the top of the Spanish Steps. *Within the various side chapels in this church are many distinguished pieces of religious art. Among these are The Assumption of the Virgin and The Deposition of Christ by Daniele da Volterra and The Flagellation of Jesus by Louis Vincent Leon Pallière. *Also a painting of Our Lady called Mater Admirabilis is preserved within the convent chapel. St Therese of the Child Jesus (d. 1897) knelt in front of this painting during her visit to Rome and beseeched God for the grace to enter the convent at the age of 15. To visit this chapel enter the door at the Instituto Del Sacro Cuore. This door is not reached by the staircase to the church but by a second staircase on the left side. *The dedication for this church is to the great 16th century Archbishop of Milan, St Charles Borromeo. A relic of his heart rests within a reliquary in an altar located behind the main sanctuary. *A relic of the skull of St John the Baptist is within the chapel to the left of the main entrance. The authenticity is uncertain since this same relic is said to be located at a number of other places throughout the world including the Cathedral of Amiens in France, the Residenz Museum in Munich, Germany, and the Umayyad Mosque in Damascus, Syria. *The remains of St Sylvester I (d. 335) rest in the confessio below the main altar. Also a work from 1688 depicting the legend of St Sylvester I baptizing Constantine can be seen in the apse vault. *On September 26, 1256 a miraculous icon of the Blessed Virgin Mary appeared at this location. It was found painted on a stone and floating upon the water of an overflowing well. The first chapel on the right side of the nave preserves this miraculous well and icon. Cups are normally provided so that pilgrims can drink some of the water from this well. *The two masterfully sculpted angels on either side of the main sanctuary were created by Bernini. They were originally designed for Ponte Sant’Angelo; however, they were deemed too beautiful to be placed outside. *Relics of St Justin the Martyr (d. 165) rest under the altar within the choir chapel. Kindly ask the sacristan for access. The remains of St Justin the Martyr were temporarily transferred in 1992 to the parish church of San Giustino a Centocelle in Rome. However, they have now been returned to this church.